It’s that time again! No sooner have the schools broken up, than you need to start thinking about what you need to do before they start up again! And this can be a massive source of stress for many parents, especially if you’re sending your kids off to school for the very first time. However, we’re here to help. We’ve put together a list of tips and hacks that will help to make going back to school seem like a holiday! Well, maybe not quite, but we definitely think they’ll make things a little bit easier all round! 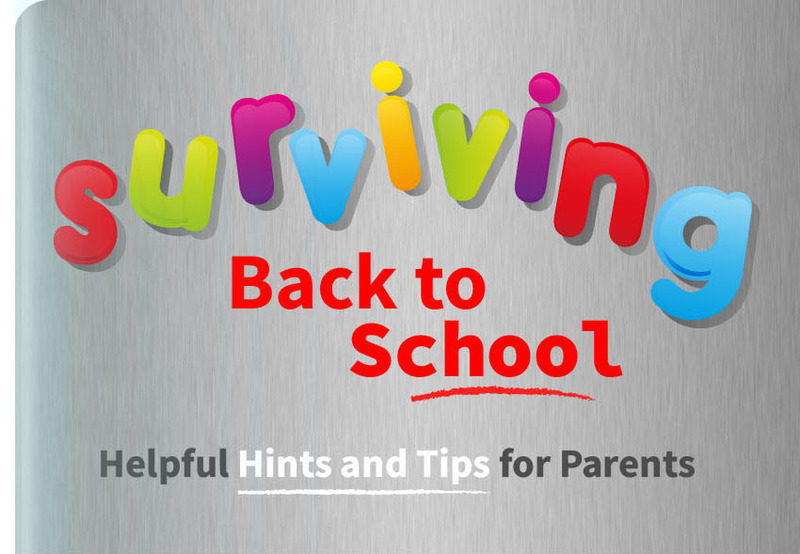 There’s tips in here for parents of children of all ages, so read on and don’t panic!! You can definitely help save yourself some stress when September rolls round by being prepared well before term starts. This will save last minute dashes into town for uniforms, PE kits, stationery and school shoes! Save yourself some sewing and get some iron-on name tapes – much easier and less fiddly, even if you’re not a fan of ironing! Alternatively, get the sew-in ones, fold them over and stitch the two ends into the garment. That way, you’ve only got to pop in a few stitches instead of going all the way round! Make sure you replace any old name tags that might have fallen off, and add them to any new items of clothing. Check the fit and state of uniforms. You don’t want to get to the end of the holidays only to realise that there’s a huge mark on their jumper and their trousers are too short! If you need to hit the shops, then go alone (school uniform shopping is no fun, even less so when tired and whining children are along for the ride), make (and stick to) a strict list and make sure you don’t leave it until the last minute. No doubt, over the summer, your kids will have got used to later nights and lie-ins, so it’s important to get them back into their normal routine before school actually starts. Start sending them to bed earlier and getting them up at the time you would for school (but make sure they still get at least 9 hours of good sleep), so that it doesn’t come as a shock to them when the alarm goes off on the first day of term. For kids going to a new school, whether they’re heading to primary or secondary school, it’s also worth practicing the journey with them before term starts, so they’re familiar with the route. Term-time has rolled round and the summer holidays now seem like a distant memory. Mornings are never fun, and if you’re focused on getting the kids up, fed, dressed and off to school, it’s easy to forget to do things you need to do. Combat this by setting your alarm 15 minutes early, and getting up before the kids. That means NO SNOOZING! The extra minutes will give you time to wake up and get a few things done before the chaos of breakfast and brushing teeth begins. Make things easier for yourself by making a checklist of the things that the kids need to do each morning, after all the routine is pretty much the same every day! This might include things such as brushing teeth, getting dressed, doing hair etc. Laminate it and stick on the fridge, then you (or the kids) can tick things off as they get done. To add a fun twist to this, you could even create a morning playlist of cheerful, happy songs and set one task per song. Here’s a handy trick for when kids are putting their coats on: to stop jumper sleeves getting bunched up, get them to hold onto the cuffs with their fingers as they put their arms into their coat sleeves. Lastly, keep a box of baby wipes by the door for any last-minute clean-ups – it’s amazing how sticky fingers and mucky faces can appear out of nowhere! When you’re shopping for uniforms and P.E. kits, it’s always a good idea to have two of everything so they can “wash one, wear one” (or lose one, wear one, as is likely going to be the case). School uniform does make things easier from a “what to wear” perspective, but you’ll still save yourselves some time in the mornings if you lay out what they’re going to wear the night before. It also means you don’t have to scramble around looking for pants and missing socks when you need to be out the door! Likewise, keep errant school shoes in check by putting a shoe rack near the door. Get them to take off their shoes when they get in the house and you’ll kill two birds with one stone: no dirty school shoes trailing throughout the house, and no missing school shoes in the morning! Kids need so many bits and pieces at school that it’s easy to lose track of all the bits and pieces they need in their bags. Packing school bags the night before (making sure homework’s in there) will save on last-minute morning panics. Leave them by the door to make sure they’re ready to grab and not forgotten. If you’ve got older girls (tweens or teens), it might be a good idea to pack a mini “emergency kit” with sanitary, cosmetic and cleaning supplies to see them through any potentially embarrassing situations at school. Think deodorant, tampons, mints, hairbrush and hair ties, nail files, hand sanitiser and baby wipes. Ah, packed lunches. Every parent’s favourite. Make things easier on yourself by preparing food ahead of time. Sandwiches can be made, wrapped, labelled and frozen, and fruit and snacks can be portioned up and popped into plastic pots in the fridge. If you freeze bottles or cartons of drink too, then pop them into the lunchboxes still frozen, they’ll keep everything else cool but be ready to drink by lunchtime! For a bit of variety from standard sandwiches, try filling wraps or pitta bread with their favourite fillings, or (for younger children) cut sandwiches into fun shapes using a cookie cutter. The bit every child dreads, but homework is a necessary evil for even very young children. Whether it’s learning to read, or long division, find out from the teacher how much time your kids are expected to spend on the work. Then agree a start time for it every day (and that they’re not allowed to watch TV, play games, play on the computer etc until it’s done), so that it becomes a part of your routine. You could also create a designated “homework area” (even if it’s just the dining room table) which again will help form a bit more structure around homework time. Make sure to keep it well-stocked with pens, pencils, rulers, calculators, glue, etc. You’ve made it through those terrifying first few days and you’re into the swing of the school year. That means newsletters, parents evenings, school plays and kids parties. Keep track of all those important appointments with a corkboard in the kitchen, and pin any letters or invitations you get to it. That way, you’ll always know what time the school disco starts, when Lucy’s birthday party is, and when you need to bake a cake for the School Summer Fair. There’s also a strong likelihood that you’ll be called upon (at short notice) to wrap textbooks, create a family tree or build a model of a volcano. It’s therefore a good idea to have a “craft stash” on hand. Old newspapers, sticky tape, glue, ribbon, buttons, pretty paper, fabric offcuts, paint, glitter, felt tips and crayons are all good things to include. If you’ve got these, you should be covered for most eventualities! It’s also a good idea to plan out your meals each week. This will save you time on deciding what to eat, that can be better spend helping with homework! Well done! You’ve survived Back to School. Now you’ve got another few weeks respite before half term comes round! Is your Mum a SuperMum?